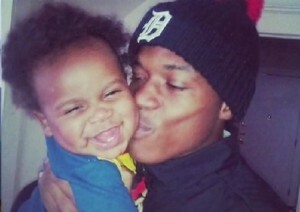 Terrance Kellom, killed at 19 by police, with baby son. 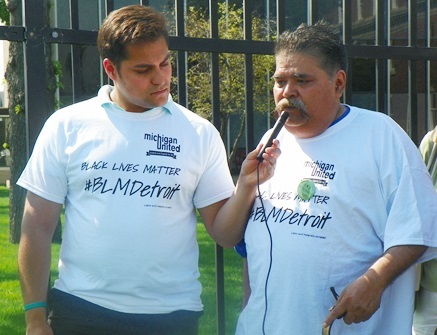 DETROIT – A coalition of groups gathered outside Detroit’s Immigration and Customs Enforcement (ICE) office on East Jefferson May 8, to demand justice for 19-year-old father Terrance Kellom, shot to death April 19 by ICE officer Mitchell Quinn with Detroit police. Speakers said they wanted ICE to stop taking part in multi-jurisdictional task forces, and called for transparency in the investigation of Kellom’s death. 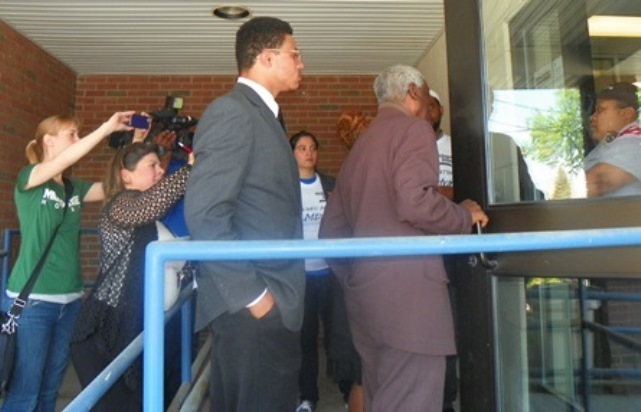 The groups included Michigan United, Black Lives Matter-Detroit, the Coalition for Black Struggle, the American Civil Liberties Union (ACLU) of Michigan, the National Action Network, the Northern Borders Coalition, the Michigan Council on American Islamic Relations (Mi-CAIR), and the Detroit Coalition Against Police Brutality, Inc. according to a release from Michigan United. 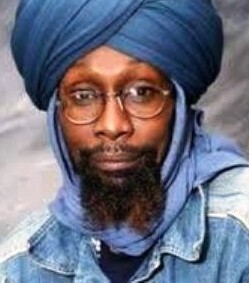 Detroits Imam Luqman Abdullah, slaughtered by 66 federal agents and local police Oct. 28, 2009. Sixty-six federal agents, with local officials, slaughtered Imam Abdullah, leader of the majority-Black Masjid El-Haqq mosque on Detroit’s west side, on Oct. 28, 2009. He sustained 21 gunshot wounds, a broken arm, and lacerations to his face and upper body, resulting from police dog bites, during a raid on an abandoned Dearborn warehouse. The Imam and his members had been set up on conspiracy and theft charges by the FBI, using confidential informants. Walid said Imam Abdullah’s family has a lawsuit pending in the Sixth Circuit Court of Appeals, naming then Detroit FBI director Andrew Arena and others as defendants. Arena now heads the non-profit Detroit Crime Commission. Mourners at Terrance Kellom’s funeral salute with “Hands Up Don’t Shoot” gestures and closed fists as his coffin is carried out for burial. Kellom was shot to death nine times. His distraught father Kevin Kellom witnessed only the first two shots by Quinn before he was pulled away from the scene by police. He has repeatedly denied police claims that his son threatened police with a hammer. According to Ron Scott, who said at a vigil for Kellom that he had seen the autopsy report, the young man sustained seven gunshot wounds in the front of his body, and two in his back. Kellom was laid to rest Wed. May 6, with over 200 attending his funeral. Young relatives and friends gave the “Hands Up Don’t Shoot” and power fist signals l as his coffin was carried out for burial. Many in the community are now questioning whether Detroit police as well as Quinn shot Kellom. Family members have not been given a copy of the autopsy report, which Wayne County Prosecutor Kym Worthy announced this week would be sealed. Some members of Kellom’s extended family issued a press release demanding a copy May 5. 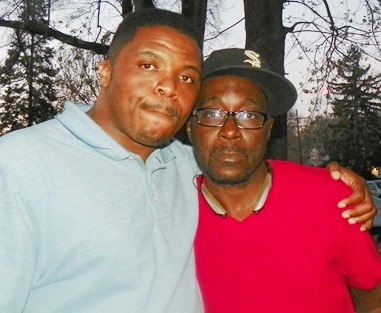 Jerry Bell, Jr. and his cousin Kevin Kellom, father of Terrance, at vigil May 2, 2015. Both the Voice of Detroit and the Detroit Free Press have filed Freedom of Information Act requests demanding copies of the report. The Freep earlier won a case, Swickard v. Wayne County Medical Examiner (1991), which held autopsy reports to be public record. It is questionable whether Worthy has the right, independent of judicial proceedings, to seal the report. 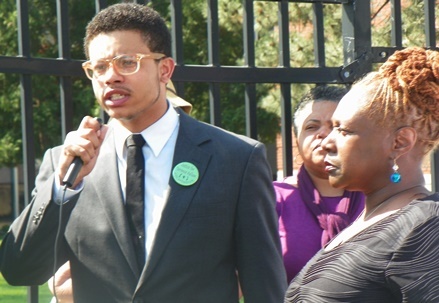 Grover Easterling III of the Coalition for Black Struggle, wearing green button for Terrance Kellom, addresses rally as Monica Lewis Patrick of People’s Water Board (background), Elder Louise listen. Monica Lewis Patrick of the People’s Water Board and Dianne Feeley of Detroit Eviction Defense also spoke. Detroit is expected to begin more water shut-offs this month, while Feeley said activist Cheryl West was evicted from her home May 7 after a long battle. She noted that victims of shut-offs and foreclosures in Detroit are predominantly Black. Luis Valencia (r)describes I.C.E. raid during which he was brutalized. Luis Valencia, a former reporter in Mexico, said his brother was killed by the drug cartels there, and his life and that of his mother were threatened. They fled to the U.S., only to experience more brutality from I.C.E., he said. 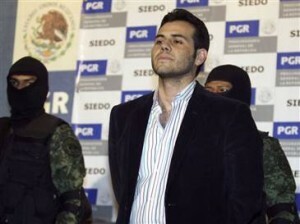 In a federal trial in Chicago during April 2011, Jesus Vicente Zambada Niebla, a top leader of the Mexican Sinaloa drug-trafficking cartel, claimed to have been working with the U.S. government for years according to pleadings filed in federal court in Chicago. Jesus Vicente Zambada Niebla trafficked drugs for I.C.E., other U.S. agencies. Zambada Niebla said he was working “on behalf of the U.S. Department of Justice, Drug Enforcement Administration (‘DEA’); and the Federal Bureau of Investigation (‘FBI’); and the Department of Homeland Security, Immigration and Customs Enforcement (‘ICE’).” He said they gave the Sinaloa cartel permission to traffic drugs in the U.S. as part of a scheme to capture members of a rival cartel. Protesters including Grover Easterling III, Ron Scott, and Imam Dawud Walid were denied entrance to I.C.E. offices. They had intended to meet with I.C.E. Special Agent in Charge Rebecca Adducci. Guards informed them both she and an I.C.E. press representative were out of the city. For further information, contact Erik Shelley of Michigan United at 248-982-6326.
the assassins of fbi,send their homicidal thugs to torture, malign and try to kill you! Expose them as the lowest form of human beings ever to live on God’s green earth.